1. A constant voltage step of adjustable magnitude depolarizes the membrane at 1 ms using a voltage clamp. The circuit features an amplifier in the form of an op-amp, whose gain you can vary to explore the quality of the resulting potential step, shown in the bottom-left panel. The total membrane current is recorded and shown in blue in the bottom-middle panel. 2. In a separate trial, the ionic currents are determined. The external concentration is adjusted such that the Nernst potential of sodium is equal to the voltage step, eliminating the sodium current. The resultant measured current consists principally of the current, shown in the bottom-middle panel in orange (leak and capacitive currents occur on a shorter timescale and thus are neglected here). Subtracting the current from the total current in step 1 gives the current, shown in green. 3. The and conductances are computed from the respective currents, voltage changes, and reversal potentials, and are shown in the right column. 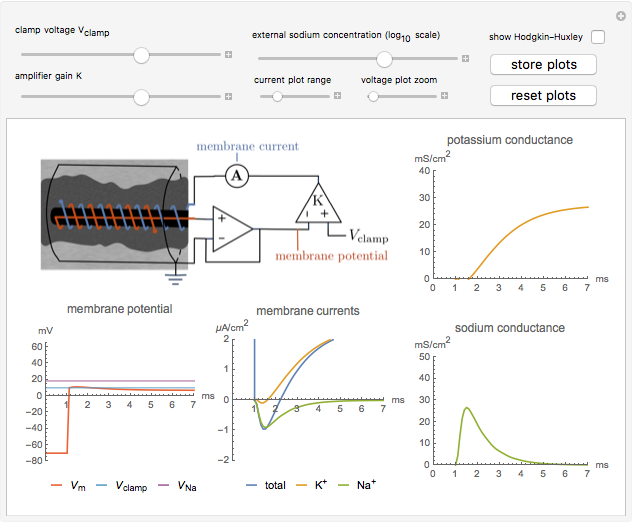 The conductance plots can be saved to show their dependence on the voltage step. The Hodgkin–Huxley neuron model is a seminal discovery in neuroscience and electrophysiology. It describes the ionic currents and resulting voltage changes that occur across a neuron's membrane. Practically, it was developed by measuring the membrane conductance of sodium and potassium ions in the giant axon of the squid Loligo, from which the governing differential equations are deduced. The essential procedure of the original experiment [1, 2] is described below. 1. A voltage and current electrode, wrapped in a glass capillary, are inserted in the giant axon (0.1 to 1 mm diameter) as shown in the diagram. The axon itself is held in place in a grounded cylinder, originally made of silver sheet. 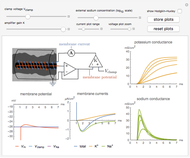 The potential across the membrane is stepped and held at a constant value using a voltage clamp . The high impedance op-amp draws minimal current from the membrane, and roughly outputs the membrane voltage . The amplifier has an adjustable gain , and outputs voltage . The resultant current is applied across the membrane using the current electrode, leading to a feedback circuit that at high gain fixes the membrane voltage . When the potential across the membrane is constant, the sum of the ionic currents must be balanced by the current applied by the voltage clamp. Thus, the measured current applied by the clamp is the same magnitude as the total ionic current across the membrane (and opposite in sign). The total ionic current is divided into three components: , , and leak (other ions). where is the Nernst reversal potential. Clearly, at . where and denote the variable extracellular and fixed intracellular concentrations, is the charge of and , and at 37° C .
When , as can be seen in the lower-left panel, the sodium current disappears. Since the leak and capacitive currents occur on a short timescale much less than 1 ms (seen in the blue spike at 1 ms in the bottom-middle panel), principally only the potassium current remains. The measured total current is now , shown in orange. The sodium current is obtained as , with from step 1, shown in green. for , and where , are transition rates between open and closed states. For further information, see [3, 4]. these equations constitute the Hodgkin–Huxley model [3, 4]. A. L. Hodgkin, A. F. Huxley, and B. Katz, "Measurement of Current-Voltage Relations in the Membrane of the Giant Axon of Loligo," The Journal of Physiology, 116(4), 1952 pp. 424–448. doi:10.1113/jphysiol.1952.sp004716. A. L. Hodgkin and A. F. Huxley, "Currents Carried by Sodium and Potassium Ions through the Membrane of the Giant Axon of Loligo," The Journal of Physiology, 116(4), 1952 pp. 449-472. doi:10.1113/jphysiol.1952.sp004717. A. L. Hodgkin and A. F. Huxley, "A Quantitative Description of Membrane Current and Its Application to Conduction and Excitation in Nerve," The Journal of Physiology, 117(4), 1952 pp. 500–544. doi:10.1113/jphysiol.1952.sp004764. Oliver K. Ernst "The Hodgkin-Huxley Experiment on Neuron Conductance"